iPhone is now supported too ! Version 1.2 is out! Please Update. Covert Browser is the only Browser on the App Store which provides real Anonymity and Privacy online ! 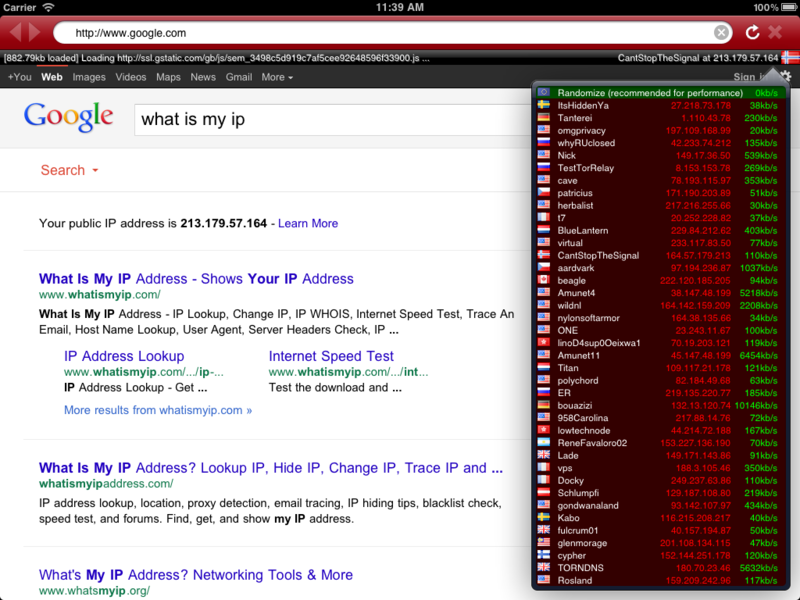 You will be able to browse from over 600 different IP-Addresses in over 100 countries ! As your connection is routed over 3 different Servers before reaching its destination (Website) there is no way for the other end to find out where you are. To secure your data along the path it is fully encrypted with strong 128bit AES Encryption. ► You need the best Anonymity you can get ? Just select "Random" from the menu, and the Software will automatically change to a new IP-Address every few minutes. ► You need to connect to a website from a specific country ? No problem, just select a Server from a Country you want to pretend browsing from. To do so, just tap on the IP-Address in the upper right of the screen. ► You need to access content which is blocked by your ISP ? No problem, as your ISP can not see what sites you are accessing there is no way to block them either. Disclaimer: As your traffic will be relayed over three servers the browsing speed will be slower than direct browsing. But hey, just Download the App and see yourself !